On my recent trip to Hobart, I visited the Coal Valley Winery in Cambridge not far from Hobart. There is a cellar door and restaurant and we stopped for lunch. The setting is stunning with sweeping views across the vineyard, rolling hills and water. I will say straight up that there are no vegan dishes on the menu. But there were a lot of vegan bits and pieces on other dishes. So I spoke with the waiter and asked if we could put together some items from across the menu to make up a vegan grazing lunch. She spoke with the chef, checking that the things we thought were vegan were actually vegan. There was no problem at all, they were helpful, friendly and they put together some delicious food for us. We ended up with some hand cut chips with a romesco dipping sauce, a fabulous salad with lettuces, fennel, orange and apple, some good hummus, beautiful warm mixed olives and great bread. 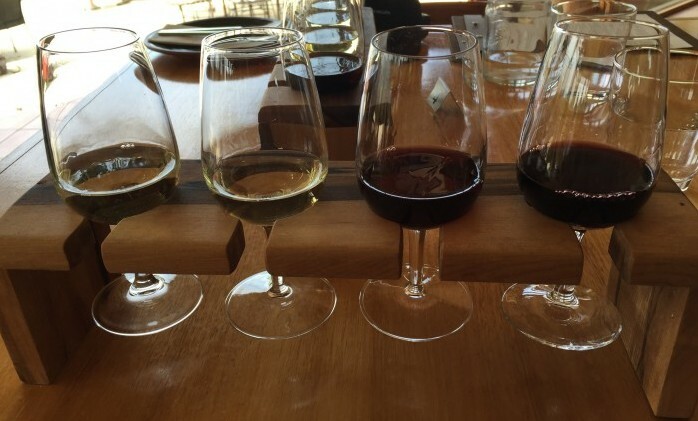 I also opted for a wine flight. This consisted of four wine choices, small pours making up about one and a half glasses of wine in total. I chose a dry riesling, a sauvignon blanc, a pinot noir and a tempranillo. All were beautiful. The wines are all vegan. It was a relaxing long lunch with friends, the food was delicious and made for us without any fuss. I’d be very happy to return. Gosh what a beautiful view and great they could put something together for you. I haven’t done wineries in years (since before-vegan) and have always wondered if there are any vegan friendly places, as so many seemed to have such a heavy focus on cheeses to pair with wine– I’d love a place that does vegan cheese and wine. With beautiful scenery to top it off!